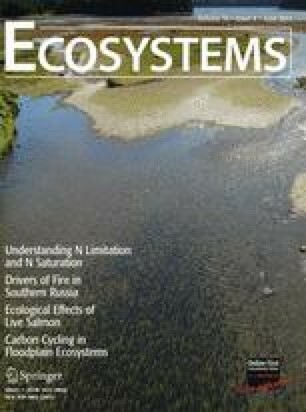 The dominant conceptual model of nitrogen (N) saturation in forests predicts the temporal patterns of key N cycling indicators as an initially N-limited forest is progressively enriched in N. We present the results from a long-term N addition experiment in an oak forest in southeastern New York State, USA, which do not conform to the predictions of the conceptual model in several ways. In contrast to the predictions of the conceptual model, the foliar N concentrations in the N-treated stands of our study increased to about 20% above the levels in the control stands and then remained essentially constant, and nitrogen leaching from the treated stands increased almost immediately after the start of the experiment, prior to the onset of elevated nitrification. Concentrations of N in soil solution of the N-treated stands peaked at over 150-fold greater than the concentrations in the control stands. There were no significant changes in potential net N mineralization. Tree mortality increased in the treated stands, but the tree mortality did not appear to be the primary cause of the excess nitrate leaching. Based on these results and those of other recent studies, we present a new conceptual model of the N saturation process focused on the mass balance of N rather than the temporal dynamics of N cycling indicators. The mass balance is characterized by inputs of N from atmospheric deposition and fertilization, internal sinks in the vegetation and soils, and outputs to leaching and gaseous losses. The key points of the conceptual model are (1) added N can flow simultaneously to all sinks and losses in the system, (2) the fate of the added N and the temporal patterns of flow of N depend on the strength of the sinks and the factors that control them, and (3) the movement of N to the various sinks determines how N saturation is manifested in the ecosystem. We distinguish capacity N saturation, in which the sinks in the vegetation and soil are zero or negative, from kinetic N saturation, in which the sinks are positive but lower than the N input rate. The sink strengths in the vegetation and soil have two components, one due to carbon (C) accumulation in the system and the other due to change in the stoichiometry (C:N ratio) of the pool. Further work quantifying the magnitudes and controlling factors for the N sinks will allow better prediction of the dynamics of N saturation in different types of forested ecosystems. Lovett designed and executed the field study. Lovett and Goodale collaborated on the development of the conceptual model and the preparation of the paper. We are grateful to Lynn Christenson, Amanda Elliott, Zachary Wallace, and especially Julie Hart for their efforts in the field and laboratory. We thank P. Vitousek and two anonymous reviewers whose comments substantially improved the manuscript. CLG’s effort was supported by the US National Science Foundation (DEB0845451) and the USDA Forest Service (Cooperative Agreement #05-CA-11242343-097). GML’s contributions were supported by the US National Science Foundation (DEB 0129138), the US Department of Agriculture, and the New York State Energy Research and Development Authority. This is a contribution to the program of the Cary Institute of Ecosystem Studies. Burns DA, Kendall C. 2002. Analysis of delta N-15 and delta O-18 to differentiate NO3 − sources in runoff at two watersheds in the Catskill Mountains of New York. Water Resour Res 38. doi: 10.1029/2001wr000292. Sebestyen SD, Boyer EW, Shanley JB, Kendall C, Doctor DH, Aiken GR, Ohte N. 2008. Sources, transformations, and hydrological processes that control stream nitrate and dissolved organic matter concentrations during snowmelt in an upland forest. Water Resour Res 44. doi: 10.1029/2008wr006983.